My attitude towards writing sounds very similar to above, but implies something very opposite. “Writing is the only thing that, I do, when I don’t feel I have anything else to do.” And hence I restrained myself. More so, as I found my earlier stints were too poor even for my own satisfaction. But this time I am going to repeat the same mistake, mainly encouraged by a number of IM members, reassured by the various activities of still profit making BCCI, and prompted by the fact that I ventured into some lesser trodden paths during my last visit to the state of “many worlds”. The feedbacks, if you have any (and specially the negative ones;)), should be directed to aarosh, kshil, naveenamohanarao and snonymous, for they are the reason this thread saw daylight. 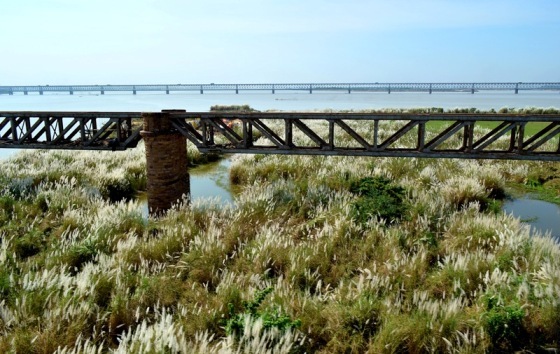 A few of the “many worlds”, that Karnataka tourism advertises, were in our consideration when planning for the two week long trip during Durga Puja this year. All in all, we couldn’t stretch it more than 16 days. And hence finally we zeroed on the following four worlds – those of Bahamani’s, Adil Shahi’s, Chalukya’s and Vijayanagara. The places now marked as Bidar, Bijapur, Badami and Hampi in modern atlas. While enjoying this fortnight long delicious buffet of architectural marvels, I got a rather rare chance to taste some of the not so well known architectural sites outside the popular tourist trail. The travel story, provided it qualifies in that category, will be more focused on the later group. We met the biggest surprise of our trip at its very earliest hours, when we reached Howrah station around midnight. Our train, coming from Guwahati had not reached even Malda (which is over 400 km from Howrah) by then. We knew for sure it wouldn’t be able to beat the Sun to reach Howrah, but decided against going back home. We made our first hotel stay in our own city. Finally the train arrived, delayed by 14 hours and reached Secunderabad by further delaying half an hour on route. We had planned to skip Hyderabad this time and start from Bidar, to make it exclusively a Karnataka tour. But another surprise was ready in store at Secunderabad Station: APSRTC buses were on strike as a part of Telengana movement, it was already past 7 PM and Bidar is nearly 130 kms from there. After a very short discussion followed by a little longer hunt for hired car followed by even longer bargaining on hiring charges, we found ourselves (3 in total) sharing a Tata Sumo with another group of 4 for a nominal charge of 2500 rupees per group. The journey concluded by waking up the sleeping hotel boys around midnight and checking in at the most unlikely hours we would have planned for. We had done something very similar only once before, and that too just 48 hours earlier. Next morning I woke up at 6 AM and went out for a walk. 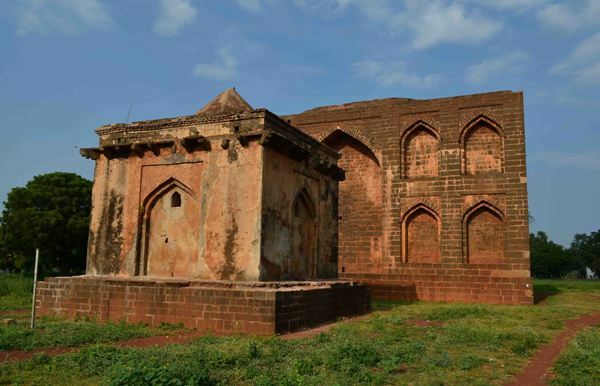 Our hotel was very close to the central bus station, which is far from the main attractions of Bidar, namely the Fort and Mahmood Gawan Madrasah. But a number of Barid Shahi rulers’ tombs including the more known, looked after and visited “Barid Shahi Park” are scattered in this part of the town. My morning stroll was meant to cover them. Just after crossing the bus station I saw a dome behind trees. 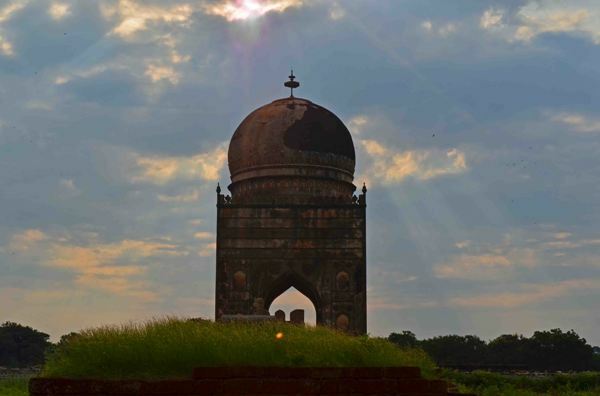 According to the map, it was either of Ali Barid’s or his son Ibrahim Barid’s tomb. Getting close I found a square structure on a raised stone terrace with four arches on four sides each of which are flanked by double tiers of arched recesses. 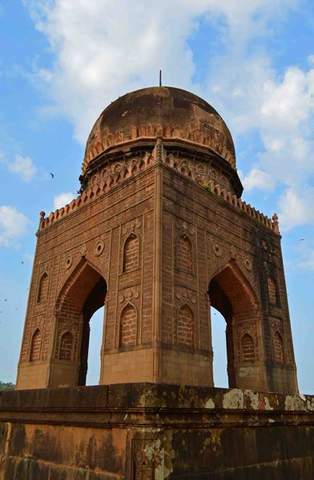 A single large dome crowns the tomb that is devoid of any minaret, the general architectural feature of all other Bahamani and Barid Shahi tombs in Bidar. Another similar tomb at some distance – reinforced my earlier assumption. 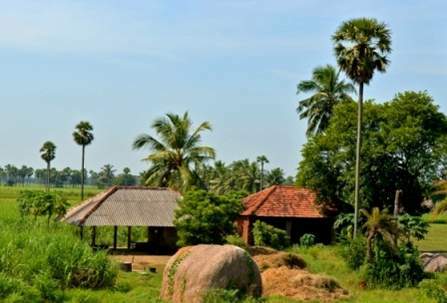 The place was used by local people as a peaceful and quiet escape for various good reasons – study, Pranayam and Yoga. Next I set out for the even lesser visited Barid Shahi tombs across the rail track. By that time I had befriended three boys, Sachin, Abinash and Asutosh, who were doing some physical exercises at Ali Barid’s tomb. They showed me the way towards the mausoleums as their home was close by them. After a vociferous 5 minute walk we reached our destination. This compound consists of four structures, and unlike the twin tombs of father and son I was coming from, each of them was architecturally altogether different than the other three. 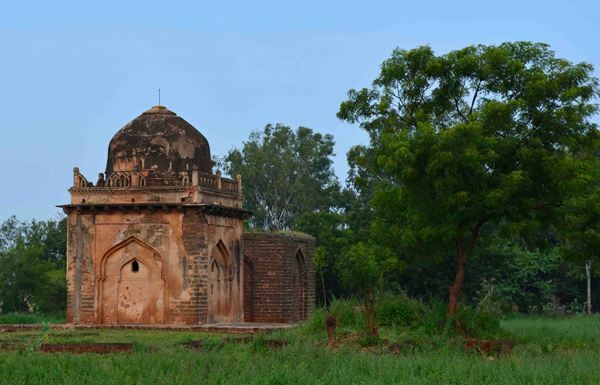 The first structure one encounters after entering the premise is square in shape with pyramidal roof and resembles two Bahmani tombs of later period at Ashtur. The adjoining tomb, which is the biggest among the four, is also a square structure with a number of arched recesses outside. 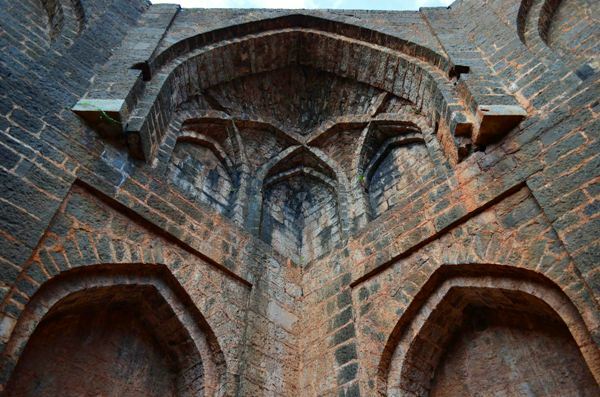 The inner wall becomes octagonal in the upper half by use of squinches, but absence of any dome on the top indicates its incompleteness. The remaining two tombs, further inside mimics the above pair in many respects. The first one is covered by a dome while the second one lacks it and the domed one has plaster on walls while the other once again has none. The most disappointing aspect of this complex was that there was no plaque from ASI to shed any light on who were resting under the graves there. Nevertheless, I was happy to venture into some place with historical and architectural value, although it had little success in attracting appreciable number of visitors compared to its more successful cousins. One request, please link the image rather than uploading as attachments, considering the brilliance of your snaps, they deserve a better quality and that's not possible by uploading it as an attachment here. This is the thread now I would be following regularly!! Congratulations Biman for finally getting down to a travelogue, and a great beginning it is too. That's horrible about the 14hr delay and bus strike. I'll be following this thread too. Biman, all this while you had enchanted us through your photos. Great to see you pitching in with your write-up. :) Great start, and don't worry, we will direct all the comments (negative or otherwise :)) towards the great names you've mentioned :D...you just concentrate on your writing and posting the photos!!! Thank you both Kaushik-Da and Snonymous, for your encouraging words. And as I have already confessed, it's the incessant encouragement from you people (and also from Aarosh and Naveena) that made me sit and start writing. It will move at snail's pace, if not slower. As we are habituated with the ultrafast processes (courtesy Kaushik-Da), it may induce an appreciable amount of boredom in its followers mind. I will give it a try when I post the next part, hopefully tomorrow. Well, from my part it was not horrible at all. Rather I enjoy unexpected incidents. I had only one grudge, had to give Gulbarga a miss. welcome to the writer's league! I am privileged to enroll in the league of these extraordinary ladies and gentlemen, rather travelers. Biman, dont worry. Nobody can match Kshil's speed at posting his entire trip log in one quick shot! Take your time, we wont get bored. I agree with Kshil, do post your photos from some external link, else they wont appear on the post as good as they ought to. Biman, many of us travel rather love to travel but not all could have same ability to look into every details, the details which if documented can be precious possession for all who would like to retrace the route. I understood your brilliant ability to get details when you answered my every single query on Badami and Hampi. I am sure this thread is going to be the Bible of many who would like to travel in this circuit. It will move at snail's pace, if not slower. As we are habituated with the ultrafast processes (courtesy Kaushik-Da), it may induce an appreciable amount of boredom in its followers mind. . It's actually much easier and less time consuming if you have these snaps uploaded in some other site. I am sure you would find it a better way to do justice to your snaps. First of all , thanks for starting the travelogue and after Kaushik-da and Naveena's TL , it will be another treasure in the "One State ... Many Worlds" forum. Secondly , thanks once again for all the photography location tips you had given to Kaushik-da. A great start , I had dreamed of reading this TL so many times and finally here it is and with a bang. Excellent start of your TL(Though the start of the journey was a painful one) - I will glued to this thread. Lo behold, 'DEAN' has had the final say! OK, just for a few hours I am into the kitchen and the 'nectar' has already been churned and distributed here? Biman, a great start! Now, we will sit back and really enjoy this report. The photographs need no praise from me but that doesn't mean I should keep quiet. 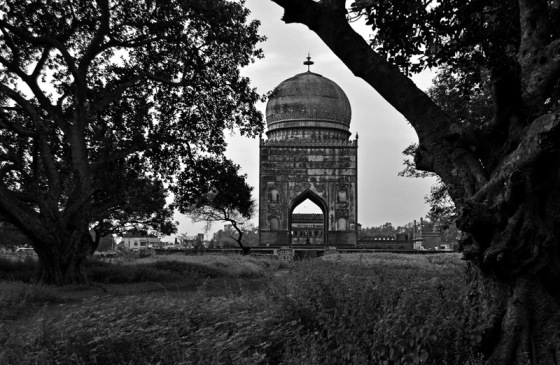 The 2nd photo of 'Ali Barid's Tomb', that you have posted, is mind blowing, surreal, etc etc! :D, YOU are born for much better things, my dear Sir! Thanks to Kaushik-Da and Naveena for making my job easier. @Sagarneel: Don't think that I haven't had a look at your posts on Sikkim. I am a silent but big fan of your reports and pictures.